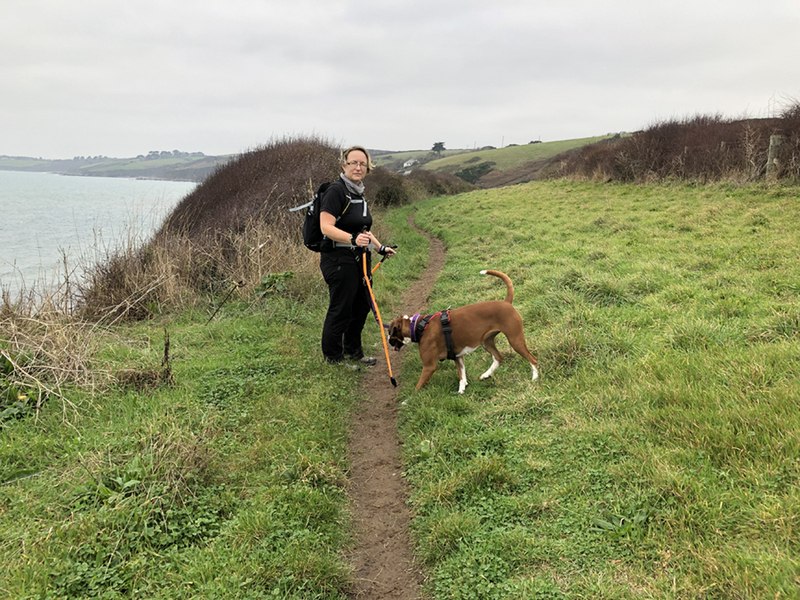 I joined my local Nordic Walking Group, Walk Kernow about three years ago and this walk was a reccy for a future Nordic Walk for Kelly, the owner and founder of the group. 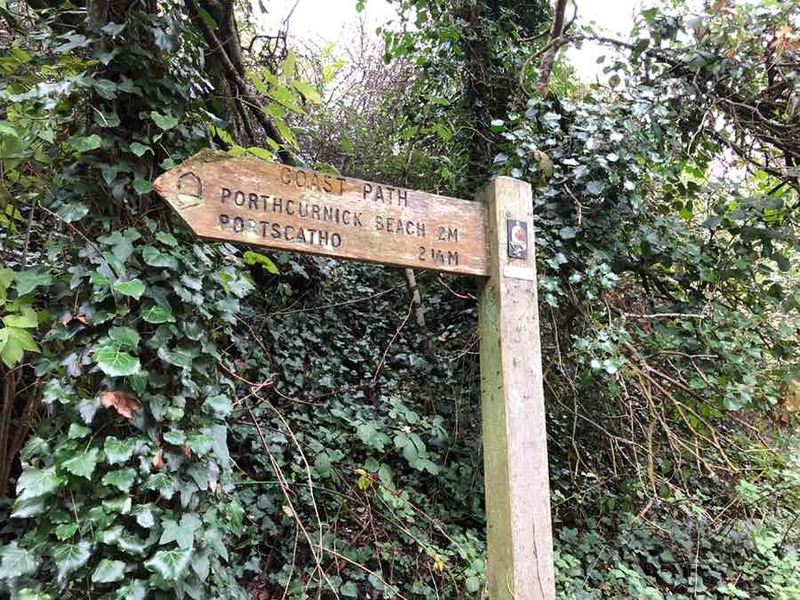 As we were doing a linear walk we met at the main car park for Portscatho just above Porthcurnick beach and left one car there then drove on to the the National Trust car park at Carne beach. We left the car park and turned right towards the fabulous Nare Hotel. I love just popping in here for a cream tea or sandwich lunch in their Conservatory restaurant overlooking the beach and maybe an ideal reward after you have completed this walk! 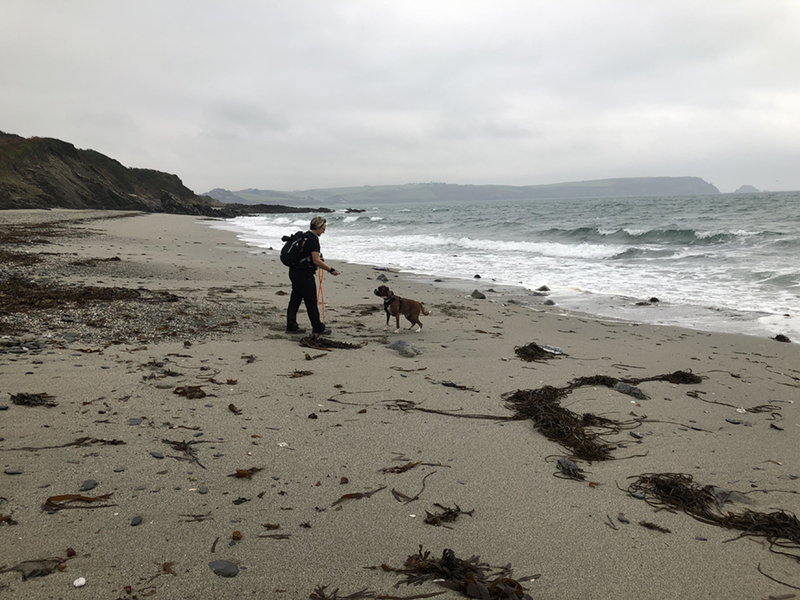 The coast path cuts across the back of the Nare car park and then heads westwards over easy terrain with glorious views back towards Nare Head and onward to Portscatho and the glorious sweep of Gerrans Bay. Kelly’s dog, Pepper came with us so we stopped at the National Trust beach at Pednvadan to give her the opportunity for a swim. It’s a wonderfully remote beach and had a fair littering of plastic debris so out came the sandwich carrier bag and we proceeded to collect all the rubbish to carry home for recycling. 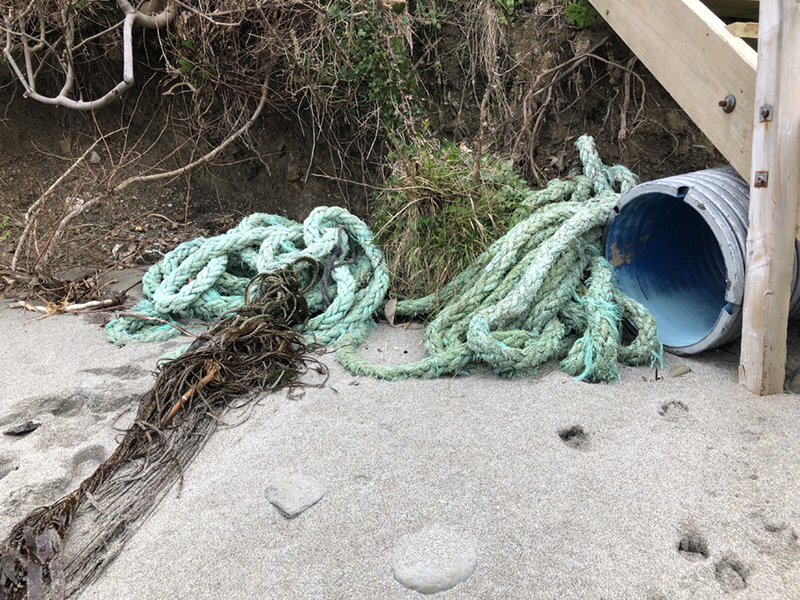 There was a giant rope too but it took both of us to drag it above the high tide line and hopefully to be collected by the wonderful NT Beach Rangers who patrol this coastline. We carried on across the beach back to the car, passing the Hidden Hut Cafe Hidden amongst the dunes above Porthcurnick beach and well worth visiting if you are here in the summer. The walk was easy, approximately four miles and took us two hours with a lunch stop. I am completely hooked on Nordic Walking and never attempt more than a leisurely stroll without taking my poles. I find I can walk faster and as you are using your arms, it is more of a workout and builds up your core strength. The poles mean that effort is shared between the upper and lower body and it makes uphill walking feel easier. Also, for older people like me Nordic walking puts less strain on joints than other aerobic activities so is suitable for people with mobility issues, especially as the poles mean three points of contact with the ground at all times so less risk of falling. good for your mental health as exercise in nature has been proven to improve your mood. As many of you will know, I walked the whole 300 Miles of the Cornish coast two years ago, aged 68. I could not have done it without the poles and they saved me from many a fall on the slippery, rock strewn cliffs.